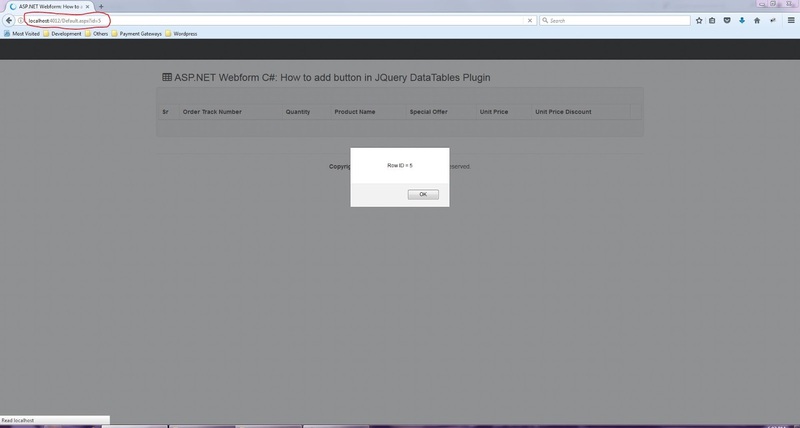 Today tutorial is an extension of my earlier article on ASP.NET Webform: Datatables Jquery plugin Server Side Integration. I have received multiple requests on how to incorporate buttons, links or any action in the datatables jquery plugin that is in correspondent with a particular row e.g. CRUD (Create, Read, Update, Delete) operations for instance. 1) Knowledge about classic ASP.NET webform. 7) Knowledge about C# programming. 8) Knowledge about C# LINQ. Since, I am extending my earlier article ASP.NET Webform: Datatables Jquery plugin Server Side Integration, so, I will not be covering the basics which is already being covered. 1) Create new Webform web application project and name it "JqDatatablesWebfoms". Here, the only change is the new header column which will contain our action button within the datatables jquery plugin i.e. 3) Now, make changes into "SalesOrderDetail.cs" file by adding new property, replace below code in this file i.e. In the above code, we have simply add new property i.e. Action of type string. 4) Now, replace following code in "Default.aspx.cs" file i.e. The above piece of code simply loads data from text file into list and create a web method that is mapped to our datatables jquery plugin. The important change as of extension to previous article ASP.NET Webform: Datatables Jquery plugin Server Side Integration is in Page_load(...) & LoadData(...) method i.e. in LoadData(...) method we have create an HTML link as string and map that value to our new action property i.e. And in Page_Load(...) method, we are simply retrieving the query string value which is row ID in our case i.e. 5) Now, replace following code in "custom-datatable.js" file i.e. In the above code, we have adjusted our jquery datatables plugin due to addition of new column and map the action property on our datatables jquery plugin. 6) Let, execute the project now and you will be able to see following i.e. In this article, you will learn about adding any sort of button, link or action within jquery datatables which is in correspondent to a particular row in order to perform operations like CRUD (Create, Read, Update, Delete). This article is extension of ASP.NET Webform: Datatables Jquery plugin Server Side Integration, so, if anyone is interested he/she can look into that article for better understanding.